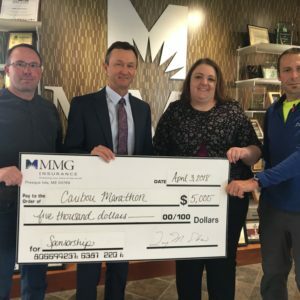 MMG Insurance has proudly signed on as a Bronze Sponsor for the 3rd Annual Caribou Marathon. This Boston Marathon qualifier is a tremendous asset to Aroostook County. This City of Caribou event has helped to foster regional pride, encouraged healthy living and promoted financial growth for Aroostook County’s tourism industry. The 2017 race had nearly 400 athletes, 200 volunteers and immeasurable community support. The positive feedback was astounding and officials are confident the 2018 event will once again draw runners from all over the United States and beyond. More information on the Caribou Marathon can be found at www.caribouraces.com and facebook.com/caribouraces.